The Champions Trophy was the brainchild of Jagmohan Dalmiya, who was ICC president in the late 1990s. It had a dual aim of spreading the game to emerging nations and raising money for the ICC in between World Cups, thus enabling it to pump more cash into those fledgling cricket countries. The first tournament, labelled as a mini World Cup, was staged in Dhaka in October 1998 and raised more than £10 million. The second, in Nairobi, was a commercial success although the crowds stayed away. By the time the 2002 event was held - and there was disquiet as it was so close to the World Cup five months later - the idea of playing in developing nations had been ditched (in fairness, options had already been exhausted) and as revenue-generation was the main raison d'etre, it needed to be in one of the main countries as this allowed the format to be expanded. In 2004 the jamboree moved to England and it became clear the format of group games led to too many meaningless games. By the time the 2006 tournament in India came into view, the event was under fire from some quarters, and at one time there were even hints that India might decline to take part in 2008. They did not, but against the rapid growth of Twenty20, the Champions Trophy grew more unloved, other than by the money men, with each passing event. All matches were played at the Bangabandhu Stadium in Dhaka, but the slow and low pitches produced some poor cricket. Severe flooding threatened to cause the whole show to be moved to India, and it only got the go-ahead at the 11th hour. As it was, Dhaka was the third choice after Disneyworld (Florida) and Sharjah. Some sides were less than enthusiastic about the whole venture - England got dispensation to send a virtual 2nd XI - but that was more than compensated for by massive crowds which flocked to games, even though Bangladesh weren't invited to their own party. The knock-out format, with eight matches compressed into nine days, fuelled the locals' excitement. South Africa won by beating West Indies in the final, although Wisden noted that "it was thus a tournament in which the winning really was less important than the taking part." However, not one journalist from either finalist attended the match. The second event included Bangladesh - on the verge of joining the Test-playing countries - and hosts Kenya. The format remained a straight knock-out - and the Nairobi Gymkhana, which had received a million-dollar refurbishment ahead of the event, hosted all games. But unlike Dhaka, local interest was poor and crowds were dismal. "The only sadness was the lack of local interest, and the suggestions of match-fixing that subsequently surfaced in the Anti-Corruption Unit's report to the ICC," reported Wisden. "While India's matches attracted decent numbers of ex-pats, indigenous Kenyans were noticeable by their absence throughout. Critics blamed high ticket prices (up to £20) and excessive bureaucracy. One thing was certain: the tournament should have done more to promote cricket in East Africa." New Zealand surprisingly beat India in the final, thanks to Chris Cairns's 102, but it was a one-off success - their next 13 ODIs produced 11 defeats and just one win. The proximity of the World Cup, less than five months later, poor organisation and a revised format that meant most group matches were all but pointless, took the sheen off the event, and more surprisingly the public stayed away despite low ticket prices. The pitches were slow and low - which was anything but good preparation for South Africa - and with the monsoon looming, the heat and humidity were intense. The ICC also decided to use the tournament to experiment with technology (Pakistan's Shoaib Malik became the first victim of an lbw decision deferred to the third umpire). While it was useful for lbws (where the only referral was whether the ball pitched outside leg stump) it proved almost useless for disputed catches. The ICC abandoned the trial soon after. Sri Lanka and India only sent full-strength sides after contract disputes were settled at the last minute, but Sri Lanka made it to the final after a popular win over an unpopular Australia. However, they shared the trophy with India when both attempts to finish the final were washed out by tropical storms. "In the end, the two false starts summed up the tournament," Wisden concluded. "Half-baked and inconclusive." The growing weariness with the event (Wisden described it as "the tournament that veers between being the second most important in world cricket and a ludicrous waste of time") was unchecked with it being held so late in season that cricket was all but forgotten by the media. The continuation with the format that had been so flawed in Sri Lanka did not help, and the inclusion of the USA - a ragbag of past-its and never-weres - just added to the feeling that this was a pointless exercise. Apart from the final and India's matches, attendances were again dire. "In keeping with the strained relations between the ICC and the hosts, the ECB, recriminations were muted but inevitable," wrote Matthew Engel. "It is not easy to apportion blame precisely for this fiasco, but between them the two governing bodies constituted a deadly combination." Those spectators not put off by high ticket prices, early starts and autumn weather experienced the ICC's ambush-marketing policing in its full glory as drinks and t-shirts were confiscated. The ridiculous nature of the corporate stranglehold was underlined by the fact that punters could not buy England shirts at club shops because their sponsors - Vodafone - were rivals of one of the official "partners". The final, which witnessed a remarkable comeback by West Indies to defeat England in almost pitch darkness, offered scant consolation after such a poor competition. "The main memories will be of cold and wet, of organisational disasters," Wisden concluded, "and of the general sense of a doomed competition that did cricket far more harm than good, all of which was obvious and avoidable." The fifth edition, held five months before the World Cup, will be best remembered for Australia's eventual capturing of the one piece of silverware that had previously eluded them. High-priced tickets kept Indian fans away, Diwali season was also a distraction. Un-subcontinental pitches meant there was little cheer for the hosts as well as other teams from the subcontinent. With the termination of the monsoons just prior to the tournament, the pitches had not settled, and provided bounce and lateral movement - something the Australian bowlers, notably Nathan Bracken, Mitchell Johnson and Shane Watson - utilised to the hilt. In a way, the pitches provided more even contests between the bat and ball, as opposed to the batsman v batsman game that ODIs in India were threatening to become. "The one that New Zealand and South Africa played on in Mumbai was a real shocker, with the top coming off at the start of the second innings," noted Wisden. Though USA and Kenya did not feature from the previous tournament, a qualifying round meant the number of matches increased from 15 to 21. The steady performances of Australia, South Africa, New Zealand and West Indies took them to the semi-finals. Events in the lead-up to the final between Australia and West Indies were forgettable at best. "The pitch problems jolted Raj Singh Dungarpur, the chairman of the Cricket Club of India, which owns the ground, so much that he offered to move the final to another venue," Wisden wrote. "The organisers were having none of that, though, and Andy Atkinson, the ICC's pitches consultant, was drafted in: he used polyvinyl acetate, an industrial adhesive, to bind the pitch together." Nonetheless, Australia's took the crown in style, winning by eight wickets under the D/L method. "Damien Martyn, who had batted so beautifully in the victories over England and India, once again played his part with a classy unbeaten 47, but it was Watson who ensured that the reserve day would not be needed as Australia's travelling support celebrated yet another triumph." A perfect shot in the arm before the Ashes, which they would go on to win 5-0. 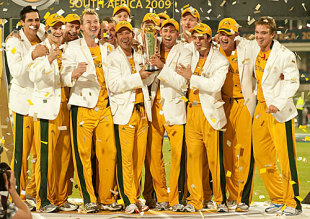 Originally intended to be played in Pakistan in September 2008 but with several countries expressing major concerns over security there, the ICC was forced to postpone the tournament and then reschedule it a year later in South Africa. While there were few genuinely nail-biting games, the quality of cricket was high and the consensus was that it had helped stem, if not reverse, the slide in the competition's credibility, although crowds were healthy only at select games; South Africa's games, the Pakistan-India tie and the Pakistan semi-final. Australia successfully defended their title, beating New Zealand with something to spare in the final; New Zealand had upset the form book by defeating Pakistan in the semi-finals, aided by poor umpiring and dropped catches.